India’s first women press photographer, Homai Vyarawalla captured the last days of the British Empire. Her work also traces the birth and growth of a new nation. The story of Homai’s life and her professional career spans an entire century of Indian history. Belonging to the small Parsi community of India, Homai was born in 1913 into a middle class home in Navsari, Gujarat. Her father was an actor in a travelling Urdu-Parsi theatre company and Homai grew up in Bombay. She was the only girl in her class to complete her matriculation examination. Having learnt photography from Maneckshaw, whom she married later, Homai was to spend nearly three decades of her career in Delhi. The great value of Homai’s work lies in her vast collection of photographs that archive the nation in transition, documenting both the euphoria of Independence as well as disappointment with its undelivered promises. She was the only professional woman photojournalist in India during her time and her survival in a male-dominated filed is all the more significant because the profession continues to exclude most women even today. Ironically, Western photojournalists who visited India such as Henri Cartier-Bresson and Margaret Bourke-White have received more attention than their Indian contemporaries. In an already invisible history, Homai Vyarawalla’s presence as a woman was even more marginalized. 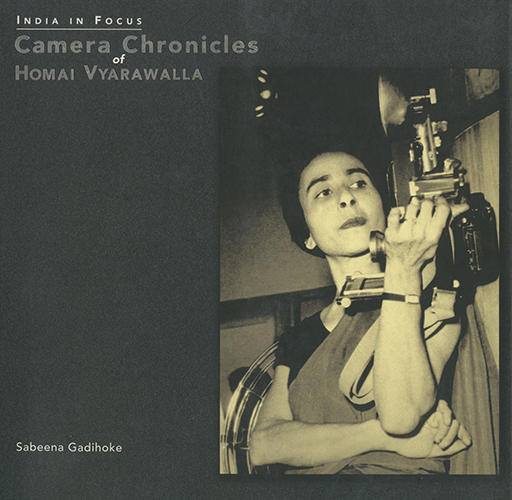 Published in the year that she received India’s first National Photo Award for Lifetime Achievement, this edition pays tribute to her indomitable spirit and her contribution to early photojournalism in India. Sabeena Gadihoke teaches Video and Television Production at the Mass Communication Research Centre at Jamia University in Delhi. She is also an independent documentary filmmaker and cameraperson. Gadihoke graduated in History from Lady Shri Ram College, Delhi University and did a Masters in Mass Communication at Jamia University. Her film Three Women and a Camera was awarded prizes at Film South Asia at Kathmandu (1999) and at the Mumbai International Film Festival (2000). She was a Fulbright Fellow during 1995-96 and has received grants from India Foundation for the Arts, Bangalore and the Charles Wallace Trust, U.K. for her research on photography.